I love Halloween. Growing up, it was always a favorite holiday of mine – dressing up in costumes, spooky walks in the dark and then sorting and snacking my way through my bag of treats at the end of the night - loads of fun! Over the years, I watched my two boys create costumes, trick-or-treat through our dark neighborhood and gleefully dig into bags filled with candy. Halloween this year is particularly nostalgic for me as it’s the last year I have a boy at home. While it’s been quite a few years since either of my sons knocked on doors for treats, having a child at home (even if he towers over me!) makes it extra special with candy corn, spiders and pumpkin carving. 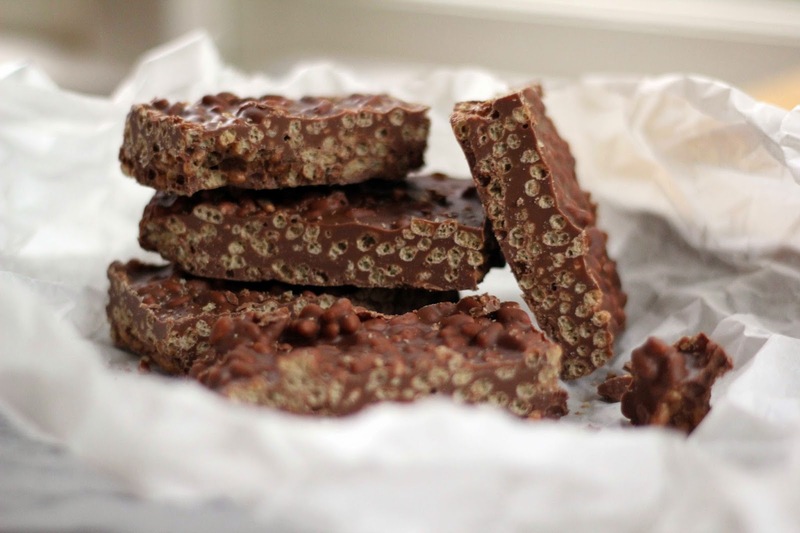 I started thinking about some favorite childhood chocolate bars, and when I saw homemade crunch bars featured on Food52 last week they practically leaped off the screen at me. A few years ago I realized I had not been giving milk chocolate the recognition it deserves. I inhaled many (many) bars of dark, dark chocolate over the years and ignored milk chocolate in any form. Then I went to an evening of chocolate tasting and it all changed. When I saw we were beginning the tasting with discs of milk, I wrongly assumed it would be sugary and bland. After one small taste, I quickly learned otherwise. 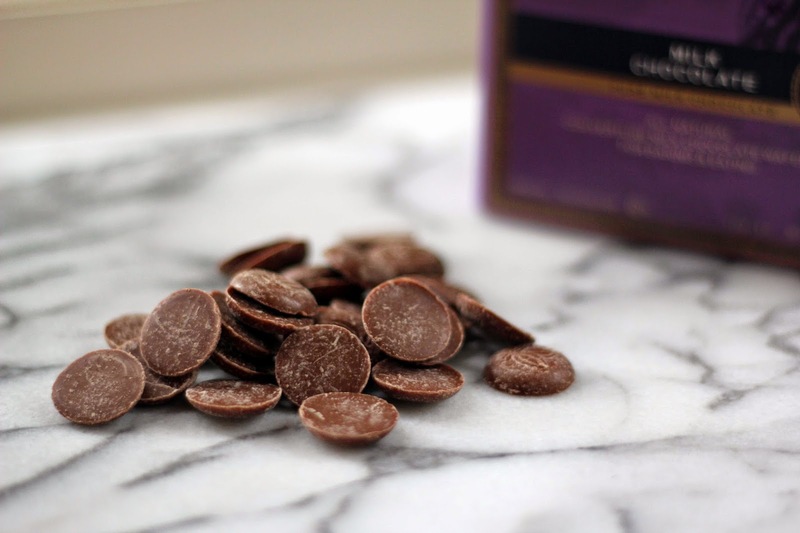 Good milk chocolate is rich, smooth and creamy, with hints of caramel. I kept tasting. Bliss. So when making homemade chocolate crunch bars, I knew I had to use pure, good quality milk chocolate. I also decided to increase the decadence a bit and use chocolate crispy rice cereal. I stopped there with the tweaking, though. I wanted to keep it simple and resisted adding sea salt or cacao nibs, as I tend to do. This is an iconic childhood candy bar and you can’t mess with tradition. Instead, it replicates the original candy bar but seriously elevates it - none of the cheap, flavorless chocolate from the bars of my youth. 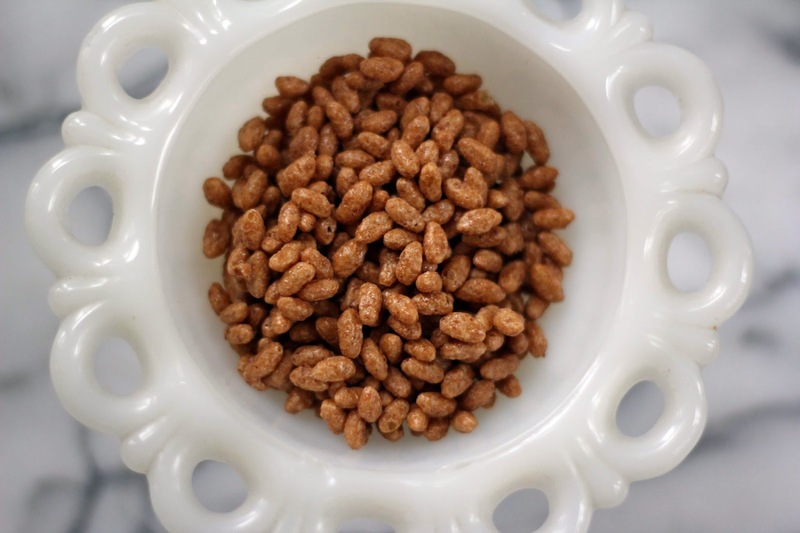 Crunchy, crispy and creamy, the puffed rice and rich, milky chocolate are dreamy together. A true classic. I pulled the pan of bars out of the fridge late at night to check them and started cutting off little slivers … be warned, this is dangerous. Many slivers later, I slid the pan back into the fridge. Watching my younger son snack on these crispy chocolate bars this week warms my heart, and I know yet another treat I’ll be sending off to my sweet boys in college. Line a 9 inch square pan with foil and set aside. 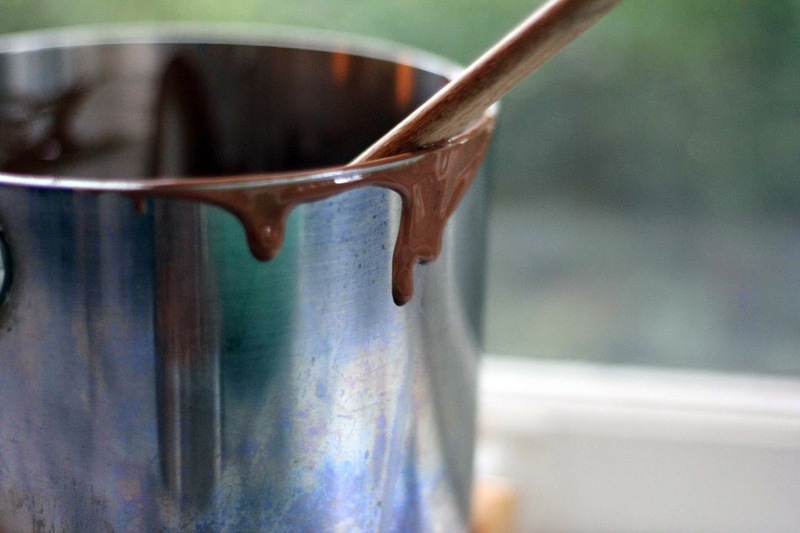 Melt the chocolate in a medium sauce pan over very low heat, stirring often, until it is creamy and smooth. Remove from heat when there are still a few pieces and keep stirring until they finish melting. You can also microwave the chocolate until melted and smooth. 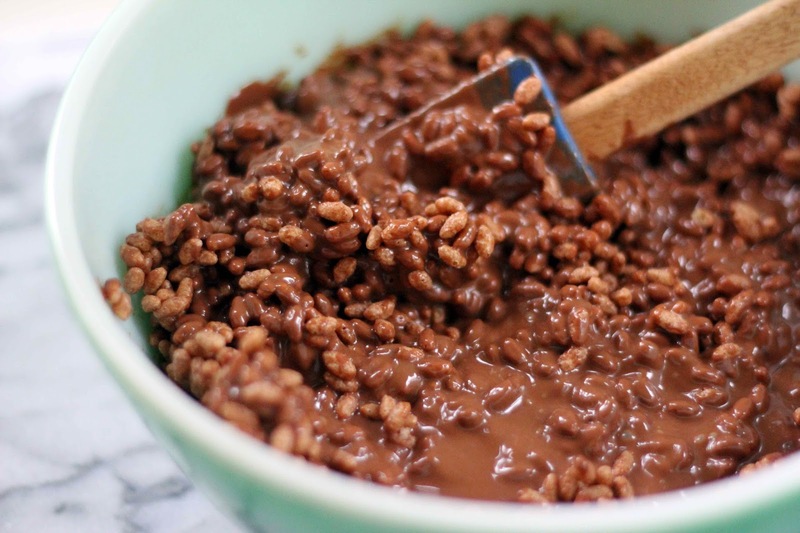 Scrape the chocolate into a large mixing bowl and pour the rice cereal over. Using a spatula, gently fold the cereal and chocolate together until it is mixed. Pour the mixture into the prepared pan and pop into the fridge for a few hours, or until firm. Remove the chocolate from the pan by lifting the edges of the foil. 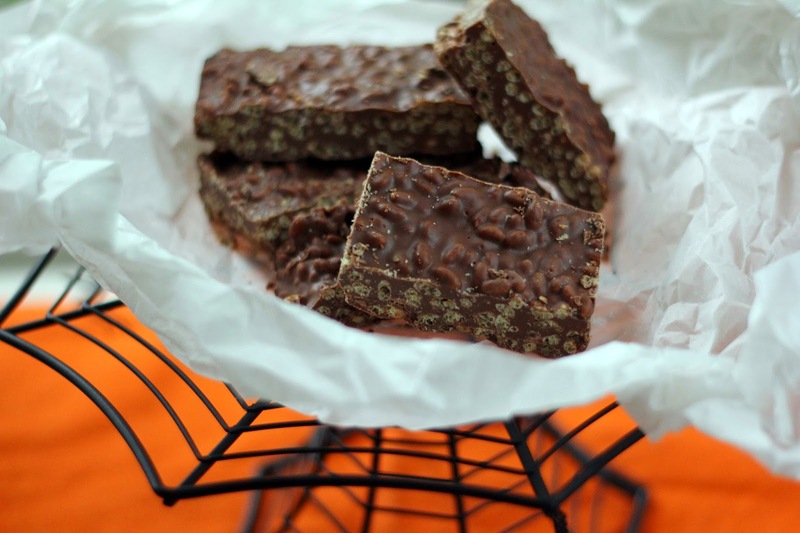 On a cutting board, cut into desired sized bars and begin nibbling. Store the bars in a cool area.